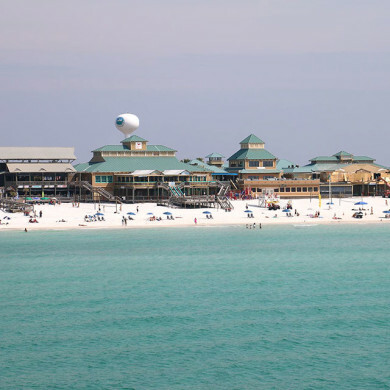 Back in the 1930s, Okaloosa Island put itself on the map when the original Tower Beach boardwalk and casino was built. After it burned to the ground in 1942, the war took precedence over its reconstruction. “I have seen what is left of pilings that are rarely exposed when the weather is ‘just right’ or ‘just wrong’ at the east side of the Boardwalk and have heard it is part of the old pier, but I cannot confirm,” says General Manager George Golematis, who has worked on the property for nearly 15 years. “Today’s Boardwalk houses world-class restaurants, nightclubs, and shops – and although they speak for themselves, beyond that I believe the Boardwalk offers one of the best views of the Gulf of Mexico, as well as some amazing sunsets,” he says. There are also covered picnic areas, volleyball nets, a playground, public restrooms, outdoor showers, and parking just off the beach, so you don’t have to haul over the dunes loaded down with beach supplies. Make your way down to the Boardwalk, where you’re sure to find ways to fill your day … or night. Have a progressive dinner with friends. Order appetizers at Floyd’s Shrimp House, dinner at The Black Pearl and dessert at The Crab Trap. Fly a kite! Pick yours from an array of beauties at Kitty Hawk Kites, then entertain beachgoers with your inaugural flight. Looking to cool down? Pino Gelato has you covered with authentic Italian gelato that is bursting with flavor. Stop into Islanders on the Boardwalk or Surfside Outfitters to revamp your beach look with shiny new flip-flops, bikinis, or board shorts. The Boardwalk believes in a good time, but also a good cause. Golematis says the complex extends support for local military, as well as numerous area charities, including the 46th Test Wing, Emerald Coast Wildlife Refuge, Children’s Advocacy Center and Toys for Tots. The Boardwalk is located at 1450 Miracle Strip Pkwy SE, Fort Walton Beach, FL 32548. For more information, visit the Boardwalk website or call (850)796-1782.